During the last political campaign I attended a conference by a representative of the French left-wing organization Attac. I was tired and, to tell the truth, it was boring. It was one of the things you have to do when you are into politics. The theme of the conference was "building a new world" and the speaker was particularly keen to convince us that the people from the Third World rejected our way of life and were ready to adopt, if not degrowth, at least some kind of voluntary frugality. A few weeks later at work, I had a conversation with a cleaning lady from Congo-Kinshasa. She told me that she planned to get French citizenship, and that the main problem in France was that you could not make money in France because taxes were too high (she also told me she was a good housewife, but that's beside the point). 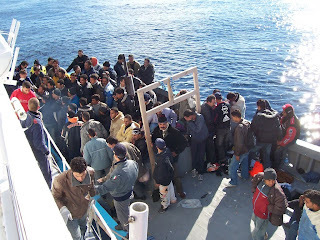 At about the same time, the Tunisians, who had just got rid of their dictator, began to cross the Mediterranean in makeshift boats to have a taste of European prosperity. 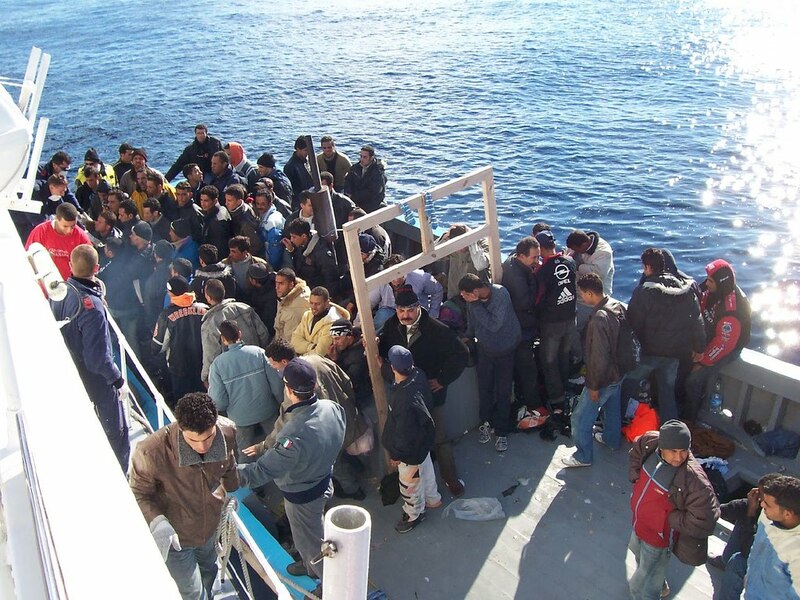 They land on an Italian island, Lampedusa, then head to France, where they hope to settle. This has triggered a kind of diplomatic crisis, as France suspended the Schengen agreement and closed its border with Italy to non-Europeans, stranding a lot of Tunisians in the Torino region. Needless to say, this did not amuse the Italian government. One could not imagine more striking a contrast between the delusions of the intellectual and the reality of the common people. Even though the intelligentsia is fairly young as a class, the intellectual is a fairly old figure. Whether he was called shaman, high priest or philosopher, he provides society with meaning, cohesion and legitimacy. In times of change and danger, they provide it with choices and possibilities. The plural is important here, for when a culture is under stress, it turns to its intellectuals for a response, and even though those responses generally spring out of the culture's tradition, they can be dazzlingly varied in nature. Thus, when the ancient Israelites, whose political ideal was theocratic, were faced with the hard reality of occupation by a pagan power, they developed a variety of answers. Some decided to cling to the traditional sacerdotal order and reach an agreement with the occupiers. Some decided to use force. Some retreated into the desert to wait for God to intervene and fix the situation. Some disconnected God and the people from Jerusalem and the temple and built a community in exile. Some disconnected God from the people and brought it to the pagans. Most of theses movements were dead ends. Others were counterproductive, drawing the wrath of the Roman Empire upon the very people they were supposed to defend. A few were successful – what we call rabbinic Judaism, karaite Judaism and Christianity – and opened up a host of new perspectives and possibilities both for the Jewish people and the world. As you probably have noticed, we are in a similar situation. Since the triumph of Christianity, the Western World is based upon the idea that history has a meaning and a direction. Our world was considered transitional, a mere waiting stage before the second coming of Christ and the Advent of the eternal Kingdom of God. History was no longer a cycle or a haphazard succession of events, but a march forward during which the Church's role was to guide and prepare the people for the end times. Islam, by the way, is quite similar in that perspective. The Enlightenment and the various ideologies born from it got rid of God but kept the Christian vision of history by repatriating the Kingdom of God and making the building of some utopia the ultimate goal of mankind. Of course, that meant we had to find a terrestrial substitute for Christ – not an easy task to say the least. Some, for instance the Saint-Simonians, chose the scientist and the engineer – this is the vision of the world which pervades Jules Verne's Promethean novels. Others chose the entrepreneur – that was Ayn Rand but also the laissez-faire crowd, which dominated world affairs in the eighties. The most popular choice among the intellectuals was, however, the proletariat. Western intellectuals were indeed faced with a paradox. Although theoretically committed to equality and progress, they had, as Raymond Aron demonstrated in his seminal work L'Opium des Intellectuels, an essentially aristocratic way of life. Marxism offered an answer to this predicament. Marxism, especially in its Leninist form, is essentially a repackaging of apocalyptic Christianity with the proletariat in place of Christ, the Revolution in place of his Second Coming, and a lot of pseudo-science to make it palatable. From the intellectuals' point of view, it had the advantage of providing them both with a cause worth fighting for and a leading role in the fight. Indeed, while it was the proletariat which was supposed to make the Revolution, the Communist Party, and therefore the intelligentsia, had a crucial role in helping it to forge its “class consciousness” and elaborate “revolutionary theory”. For mid-twentieth century intellectuals it was very seductive and a lot of them jumped onto the communist bandwagon; Aragon, Sartre, Gide, and Bernard Shaw, for instance. This proved short-lived, however, and as the body count mounted, the intellectual support for Marxism collapsed. This did not stop the intelligentsia’s quest for a messiah apt to usher in the Better World which is still central to its vision of the world. While some former leftists went the neo-conservative way, on both sides of the Atlantic, most preferred to give their attention to other worthier groups. By not bringing about the Communist utopia, the proletariat had failed the intelligentsia and deprived it of what it thought was its historical role. In the intellectuals' collective mind, the proletarian hero became the “beauf” — a French word which could be translated as “redneck” or “white trash” — forever guilty of not being progressive enough. Instead, the intelligentsia focused on various fringe groups, whose main advantage was being fringe... and who'd better remain so. Of course, the fate of all minorities is to assimilate or integrate into the mainstream; or, for territorial minorities, to create their own separate mainstream. By doing so they betray the faith intellectuals put in them and are instantly relegated into the “beauf” category. Immigrants, marginal tribes or inhabitants of the Third World, preferably far away, are better targets for the intelligentsia's projections. Of course, they are just ordinary people trying to improve their lot and make the best of an admittedly bad situation, and most of them don't share the revolutionary delusions of the intelligentsia... when they don't actively reject them. Third-worlders and immigrants don't want to bring down the affluent western democracies; they want to live in them, and are ready to risk their lives to do so. Immigrants, when they manage to settle in a rich country, aim to integrate and climb up the social ladder... and in the long run they succeed, or at least they have succeeded as long as essentially free energy has enabled Western societies to provide their citizens with a plethora of reasonably well-paid jobs. The intelligentsia's delusions can, however, become frankly counterproductive as the beginning of the energy descent plunges industrialized economy into quasi-perpetual depression. Migrations to and within the industrial world won't stop anytime soon. In fact they will probably increase as political chaos spreads in the Third World. No matter what we do or want, we will have to deal with them. Unfortunately, we are stuck between two equally unhealthy visions : that of the left intellectuals, who see immigrants both as victims of “capitalism” and as a kind of new proletariat ushering in the long promised “better world”; and that of the populist right, who see them as a barbarian horde right out of the Camps des Saints. Caught in the middle, governments, whether national or local, try to clean up the mess without infuriating the fanatics of their own side. Most of the time, this means publicly burning a few trees to hide the forest. Needless to say, tokenism won't get us anywhere in a world of growing problems and dwindling resources, and the people – those whom the intelligentsia has come to consider an annoying irrelevance – are painfully, if obscurely, aware of it. They feel that the “better world” is a delusion but remain prisoners of a worldview based on it. This makes them only too vulnerable to the scapegoating tactics of the populist right. The result is that instead of a peaceful integration within the general framework of French society, we have a growing polarization between natives and immigrants. This polarization is fueled both by the demonizing rhetoric of the populist right and the wishful thinking of the intellectual left. Both prevent the immigrants, and some of their most salient cultural features such as Islam, from integrating into the mainstream. Both force them into a ghetto. But in the meanwhile, an opportunity happening, when these most cruel robbers had returned home, the poor remnants of our nation (to whom flocked from divers places round about our miserable countrymen as fast as bees to their hives, for fear of an ensuing storm), being strengthened by God, calling upon him with all their hearts, as the poet says,—"With their unnumbered vows they burden heaven," that they might not be brought to utter destruction, took arms under the conduct of Ambrosius Aurelianus, a modest man, who of all the Roman nation was then alone in the confusion of this troubled period by chance left alive. Gildas was quite biased and most probably oversimplified a complex situation – the first kings of Wessex were British, after all – but his and his fellow churchmen's rabid rhetoric certainly did not help. The delusions of his successors won’t be more productive. N'eo ket fall an dezvarn mañ, med n'oant ket deuet ar saozon e Breizh veur evit degas pizzaiou d'ar romaned. Reminds me of a saying: "intelligence gives you no guarantee of being right -- it just provides more creative and interesting ways of being wrong." Gwen, gwir eo met ne oant ket alouberien kennebeut. Goprsoudarded e oant. Ne oa ket Aella ur roue ha ni a oar dre vBeowulf ha Emgann Finnsburh e oa Hengest penn ur bagad a gadourion mesket o orin, pas roue ur meuriad. Hervez Laycock e emsavadeg a oa ivez - ha moarvat da gentan - hini tud Kent a-enep Vortigern, a oa e ziazez e Powys. Gwen, it is true, but they weren't invaders eithers. They were mercenaries. Aella never was a king and we know through Beowulf and The fight at Finnburh that Hengest was the chief of a warband of mixed origin, not a tribal king. According to Laycock, his revolt was also - and probably first - that of the people of Kent against Vortigern, whose base was in Powys. Dwig, it can be even trickier. During the sixties they would say "better to be wrong with Sartre than right with Aron". The names have changed, but not the behavior. So true. We intellectuals babble on, but we are squeamish about embodying what we preach. We fiddle with words... and stay safe. Sigh. Anonymous, that's, unfortunately, not the only problem. Hypocrisy is a time-honored tradition among intellectuals, but fake radicalism can sometimes lead to disastrous policies.